Umarex M712 Full-Auto CO2 BB Gun | ReplicaAirguns.ca | New Website! Note: The video shows the KWC Airsoft version of this gun which is the same other than the different branding and ammo. Trigger Pull: The trigger pull on the Umarex M712 BB Gun is what you would expect from a full blowback, true single-action only pistol. It has a little bit of take-up and a fairly light, smooth release. When in full-auto mode, just press and hold the trigger until the ammo is gone, but don't hold the trigger too long. When the BBs run out, the gun will keep firing as the bolt does not lock back when empty. Build Quality: The Umarex M712 is well built since it is almost entirely metal. It weighs in at a whopping 3.11 pounds so be prepared for a heavier gun. 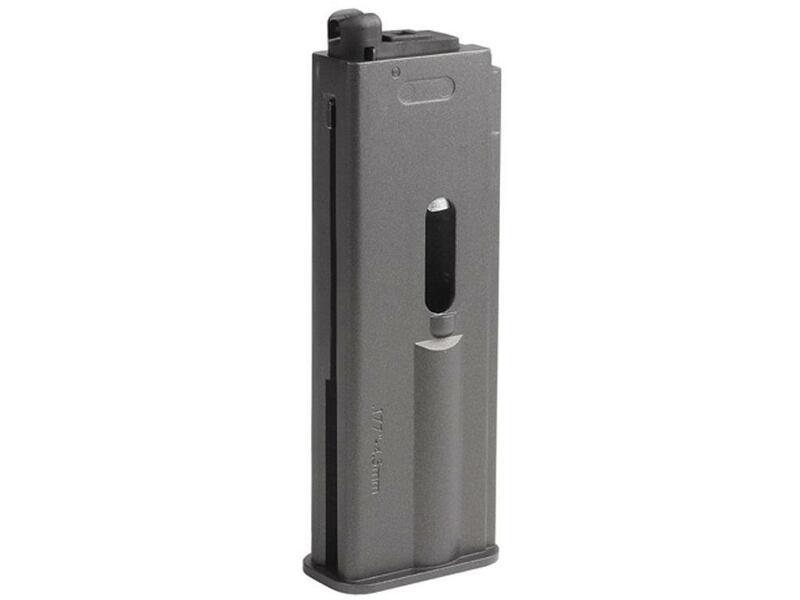 You can choose to hold it two-handed by using the forward magazine like a foregrip. Fit and finish seems very good. I really liked the dark grey finish and very believable plastic wood grain grips. Realism: The Umarex M712 BB Gun is a spot on replica of the M1932/M712 Schnellfeuer with all the same working parts, including the semi and full-auto selector switch. 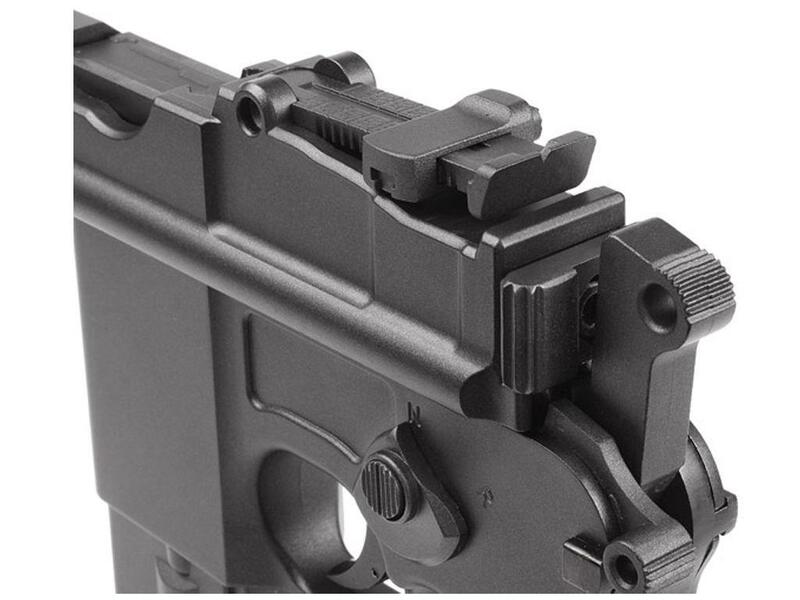 The Umarex M712 also has a full working bolt, hammer, safety, adjustable rear sight, and a full size drop out metal magazine that holds the CO2 and BBs. Comments: The Umarex M712 BB Gun is the all metal version we hoped Umarex had first made when they came out with their first iteration, so this should make everyone pretty happy. I really liked the super high FPS and ultra-fast rate of fire in full-auto mode. 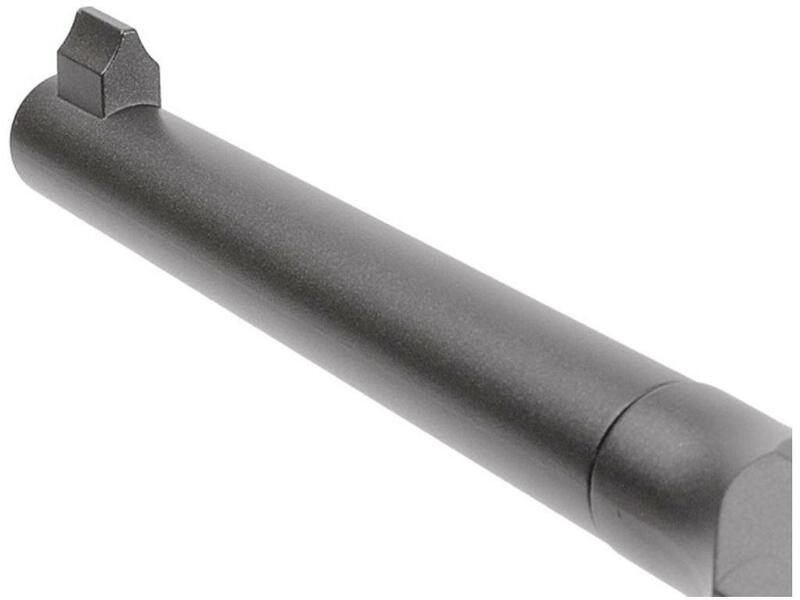 It's a great replica with awesome blowback action and a super-fast trigger. Another must-have classic war pistol to add to the collection! The Mauser m712 is my favorite gun. I think this is everything you could want, fully working parts and full auto which is fast like 3 taps of a trigger pull and BAM, 3 rounds left. I got 3-4 clips with semi and 3 with full-auto. A warning though, watch out for holding too close because some co2 might get in your face. BTW this is the same as the kwc but cheaper, so buy this one. The only drawback is it will not lock back at the last shot. Since I was a little boy I was intrigued by the ingenuity and design of the classic world war two pistols - My interest in replica pistols was spawned by the discovery of the Umarex re-boot of these classic German weapons. 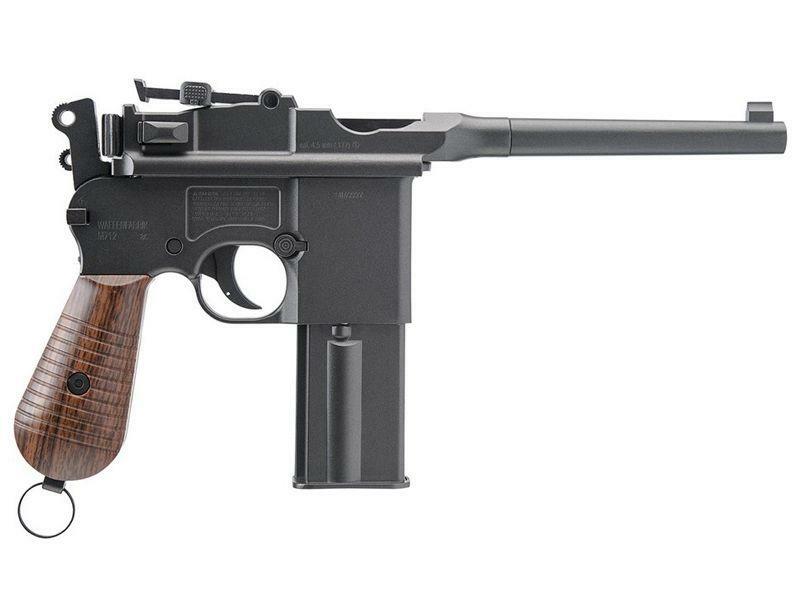 The Mauser particularly fascinated me as it seemed incredible that they could jam so much, into so little - the result being a full auto machine pistol . . . that was a very cool thing when I was 10 and apparently still is. I so wanted to love this gun when I purchased it. Sadly, I don't. I'm not going to list all of the features and functions that this gun offers. Mike does a great job of that in his video review. What I can speak to though, is the fact that this pistol is thrilling and brilliant in every respect - until the (very weighty) magazine drops out and takes out your big toe. I dismissed the initial experience as a one time incident, however clearly I am far too trusting, as it happened a second time - apparently I am also a slow learner as I allowed it to continue to happen before I realized that the only way to have my new favorite toy co-operate, was to firmly hold the magazine in the body of the pistol as I shoot - not always an easy thing to accomplish if you actually want to shoot with any accuracy. The issue seems to be with an internal catch - possibly a wear issue ( although it had almost no use at this stage), maybe a design issue- I really don't know. I used some very fine steel wool, some light paint stripper and some cold blue and weathered the finish; replaced the grips with wood reproduction grips (a little dremmeling required) - the result was brilliant - straight out of ww2. Of course, the problem in making these little enhancements , is that the warranty is now void, and the pistol cannot be returned should there be any mechanical issues. Lets remember that our 'toys' are machines, and they do go malfunction on occasion. New point - Let's talk for a second about full auto - now that is some fun! . . . it really is a blast. Lots of fun, which ended about 50 rounds later with a loud hiss and rush of gas as the cylinder dumped - still not sure why. To be fair, it doesn't do it every time - but it does do it often enough that it is no longer the favorite in my collection - not the gun that I reach for when I actually want to do a little target practice. I have a '57 Corvette, and it reminds me a bit of that. Lovely to look at, but an absolute pig to drive and a horrible gas guzzler to boot. Okay, despite all my gripes and , I still love this gun - it is actually still one of my favourites, but more of a novelty shooter and a wall hanger though. That being said - if you can get beyond the various issues, it is great value for money. Buy it anyway. 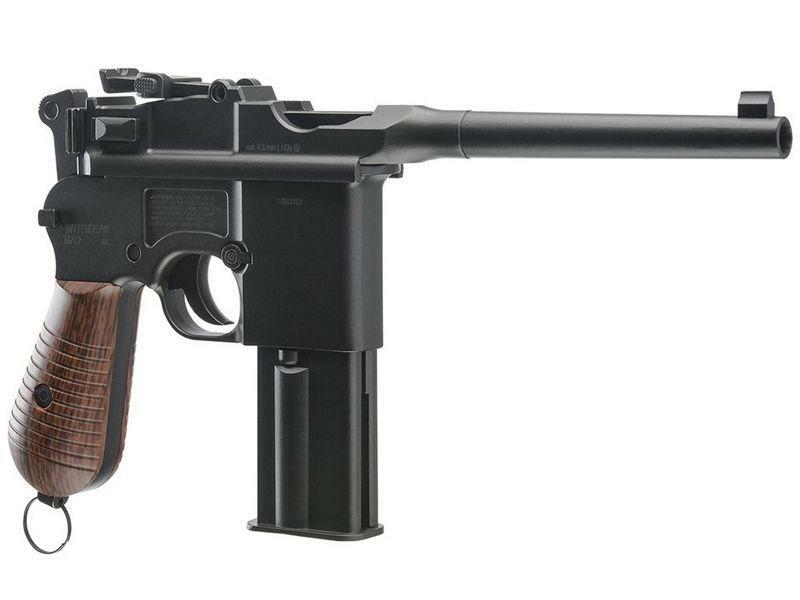 Come to terms with its shortfalls and think about what it took to re-create one of the great world war 2 machine pistols, and present it to the replica market 80 years later for less than $ 150. Pretty damned cool. 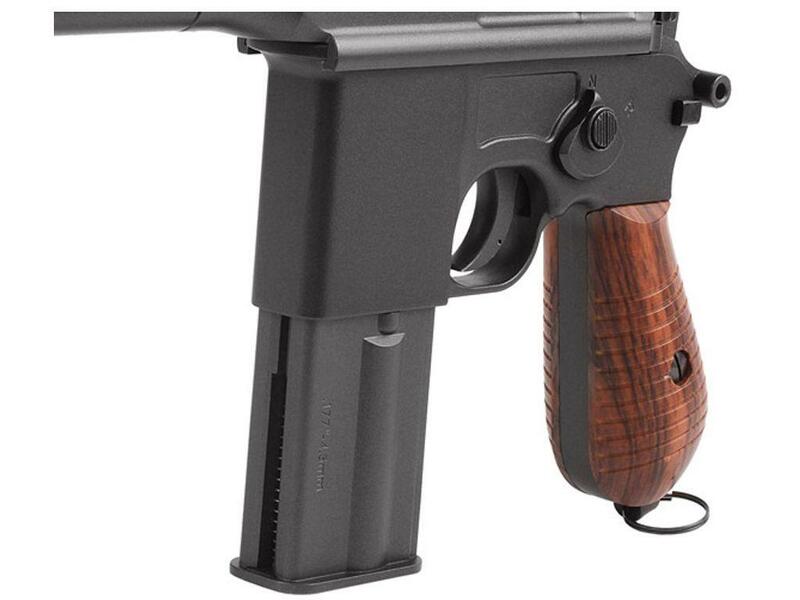 http://www.ReplicaAirguns.com - KWC Mauser CO2 Blowback Airsoft Pistol Table Top Review. 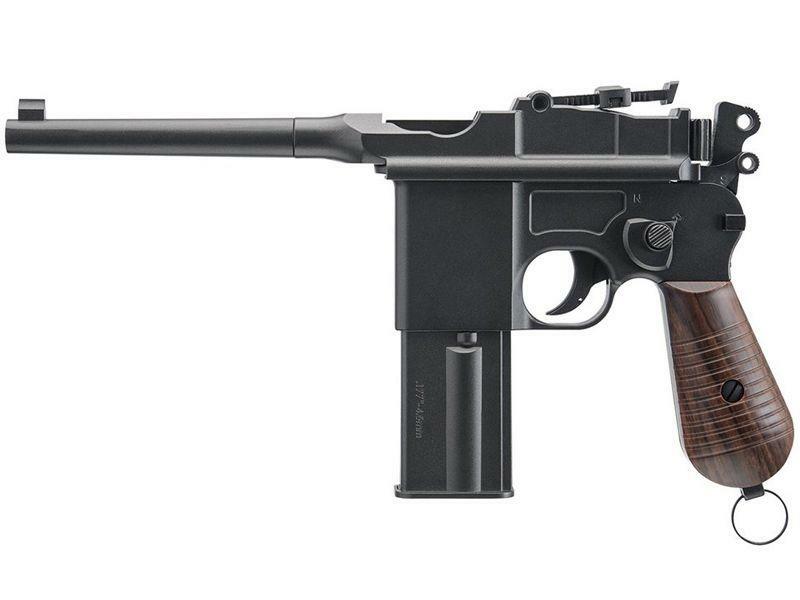 This is the Table Top Review for the KWC Mauser CO2 Blowback Airsoft Pistol. I show you around this KWC Mauser replica pistol and go over its main features and specifications. I also do a quick pre-test Field Test and talk about some of the pros & cons. 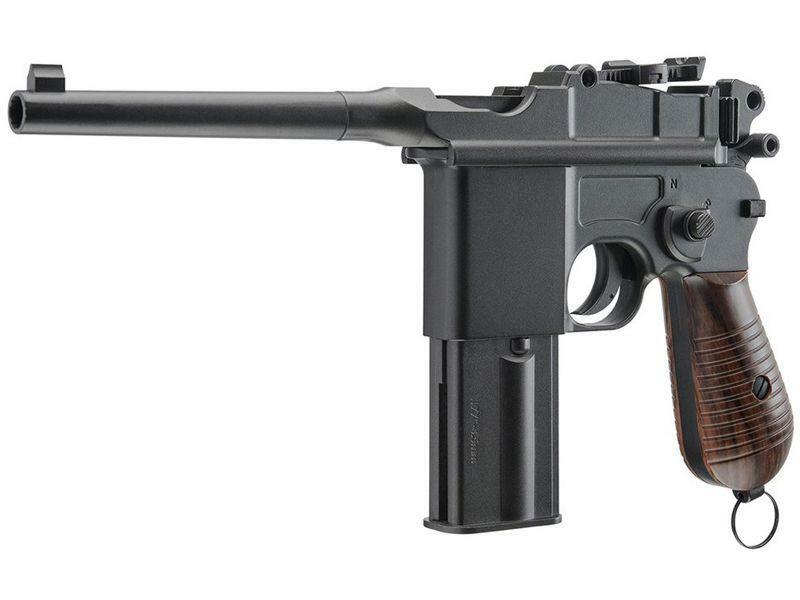 http://www.ReplicaAirguns.com - KWC Mauser CO2 Blowback Airsoft Pistol Field Test Shooting Review.